Can we speak of safe injection facilities without mentioning SisterSpace? When I learned about them I could not but search for more information. The conversation I had with Janice Abbot, the association’s executive director, was incredibly inspiring. I learned from her so many things about female drug users that I never even previously thought of as possible. SisterSpace is the world’s first safe drug injecting site which is exclusively female-access only, including trans women, queer women, non-binary people and those who identify as women. It opened on May 16, 2017, at the Eastside Centre in Vancouver, Canada. The programme is led by Atira Women’s Resource Society in partnership with Vancouver’s Downtown Eastside (DTES), the city of Vancouver, British Columbia Housing, British Columbia Women’s Hospital and British Columbia’s Provincial Health unit. The program provides a safe and supportive environment for women who use drugs. Here women can freely use psychoactive substances and opiates in the presence of health workers who are trained for intervention in case of overdose. 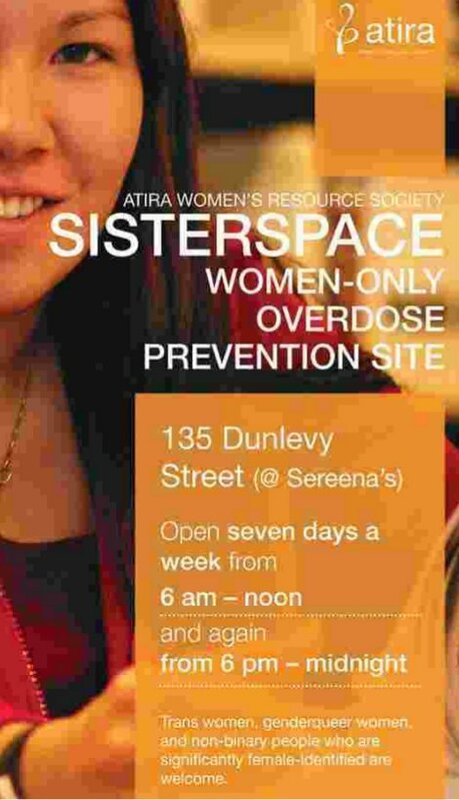 SisterSpace was opened because often women find themselves as the target of violence and abuse by men in safe injection sites lacking gender-sensitive policies. The most common reasons for such treatment are sexism and misogyny. In gender insensitive safe injections sites women often meet men who are their former rapists or men to whom they own money, or with men who simply want to do them harm. This is why they avoid visiting those spaces. In a research including 11 women who visited SisterSpace’s safe injection sites, 80% of them declared that the safe injection spaces intended for women use only are of great significance because they feel more secure, unlike the spaces dominated by men. In SisterSpace, they find emotional security. 90% of them declared that they feel comfortable and 100% declared that they will recommend SisterSpace’s safe opioid injection rooms to their acquaintances. The social and emotional support from other women and workers are identified as the main factors contributing to women’s feeling of security in SisterSpace. In those spaces, other than primary health protection, they offer food, coffee, juices and opportunities to talk. In addition, here women can get advice and directions for housing and treatment. Janice Abbot also suggested an interesting piece of information. If some of the women do not show up for a longer period of time in the safe rooms, the programme manager can file a missing person report. In this way, they provide additional support and security for their clients. And they have already filed such reports. During the course of the first three months, 115 women used SisterSpace’s services, a considerable success, especially when knowing that due to stigmatization female drug users are less accessible to support services. In SisterSpace, women have access to harm reduction services, such as sterile materials for safe drug use, which makes it possible for them to reduce infection risks and vascular damages. The time of stay in the drug use room is not limited, whereby women do not feel pressed to inject the drug all at once. The personnel noticed that many women use the time to inject two small doses, which reduces overdose risk. In “Sister Space” work only women. The health workers are trained to offer first medical aid in cases of overdose, administering naloxone, mouth-to-mouth resuscitation, cardiopulmonary resuscitation. Nevertheless, not everything is perfect there. The team is still waiting on a shipment of the drug test strips which can save a person’s life from fentanyl overdose. The peer workers, i.e., the support personnel are also women who have experience with drug use, and some of them still use SisterSpace’s service. Some of them have gone through family or friend loss due to overdose, access to substance therapies, chronic diseases and hardships in accessing the health system, homelessness and insulting behaviours from male partners, as well as the other clients. These shared experiences support forming relations of trust, based on respect and free from prejudice among peer workers and SisterSpace clients. Although very distant, SisterSpace’s example is an excellent one. Other than women feeling secure, changing their habits, and feeling accepted, some of them feel motivated and join drug addiction treatment programs. Among those, there are also other benefits: reducing public health expenses for medical care services and the emergency health service, reducing violence against women, reducing criminality, reducing HIV infection risks, hepatitis and other blood and sexually transmitted diseases. All of this contributes to a healthier living environment, where society is not exposed to contact with used needles. It also prompts changes in the culture, which on the other hand reduces the practice of drug use in public spaces. The crucial moment in SisterSpace is that this space was opened for the greater health care offered to women. Such a space is an inspiration for any future opened safe injection facility meant exclusively for women. The author has a Master’s Degree in Biology from Lund University in Sweden. She has been working on public relations and is a social media manager at HOPS – Healthy Options Project Skopje since 2015. She organizes the campaign Awakening devoted to people with rare conditions. Irena Jovanovska is a photographer and a human rights activist for marginalized communities.